Rosen Method Movement is a system of simple, gentle, range-of-motion movements that encourage students to move the way their bodies are designed to move, with the goal of helping people of all ages and physical abilities find ease and delight in their own bodies and in the movements they perform in their daily lives. Working in accordance with the body’s natural structure, Rosen movements engage the core, improve range of motion in the joints, free the diaphragm for more natural breathing, improve balance and coordination, and relax chronic muscle tension. The class structure, the sequencing of movements, and the use of music create an environment for deep relaxation and connection to one’s embodied self, creating the experience of relaxation and well-being in action. 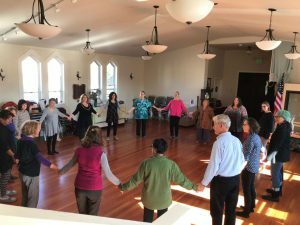 Participants find new vitality, joy, and ease in their bodies. Rosen Movement is rooted in Marion Rosen’s training as a physical therapist as well as in her profound understanding of how muscles work and how they express and hold the experiences, emotions, and attitudes of our lives. As with Rosen Bodywork, Rosen Movement can open people to new possibilities inside themselves and their lives, because the movements come from the “core” and can tug on emotions and habits and attitudes that we hold onto in our musculature. How we live in our bodies is not separate from how we live our lives; reconnecting with the very basic ways we move, through Rosen Movement, is a pathway to presence, awareness, and wholeness. Rosen Movement is grounded in awareness of the body and of the present moment: it is simple, practical, and profound. Rosen Movement generates joy!